Ever since a certain dating site scared me to death over a decade ago, I’ve been trying my best to keep a low profile. I do not wish to have any social media footprint and would like to erase digital trail as far as my personal life is concerned. Fat chance, so I’ve been told. Keeping personal data out of the hands of governments, corporations, and criminals is virtually impossible today. It’s absolutely terrifying to imagine my data being used against me in any shape or form. I wish I could turn back the clock when privacy was well and alive. Just when I have no choice to accept the disturbing reality of modern life comes Lifetime’s new romantic thriller, You. Based on Caroline Kepnes’ novel of the same title, You explores “how men and women move through the world differently,” said Sera Gamble, who co-created this unsettling yet fascinating series with Greg Berlanti, Hollywood’s most prolific producer. It totally confirms my conviction that information is power and privacy is dead. 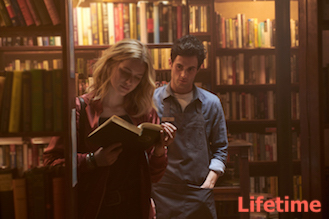 Joe Goldberg (Pen Badgley) meets Guinevere Beck (Elizabeth Lail), aspiring writer/college student, when she walks into a bookstore he manages. Immediately we hear what’s going on in his head and this seemingly harmless guy decides that there is nothing he wouldn’t do to make her fall in love with him. Joe stalks Beck (who can blame her for not using her first name) online and off-line to collect information as his tools and ammunitions. There are many obstacles in his way to winning her heart, but no problem! He weeds them out discreetly, strategically, and nonchalantly. He enjoys all the challenges, especially those thrown down at him by a fellow savior wannabe named Peach Salinger (Shay Mitchell), who claims to have Beck’s best interests at heart. Right! You know what they say; it takes one to know one. Something tells me this ain’t his first rodeo and winning might be the key word since he is not ruffled by Beck’s one-night stands and transgressions. It’s a predator-prey relationship. Joe knows what he wants, but gradually finds out Beck, his current precious prey, is not what she claims to be. Her online version caters to NY’s highbrow society she desperately aspires to fit in and is vastly different from Beck in person, who is not at all comfortable in her own skin. You asks what would you do for love? Sure, I’ve always wanted to know the inner workings of a psychopath, but Joe’s internal mental processes and justification for his offenses ‘in the name of love’ are downright chilling. I do not envy any of you having to navigate dating in the digital age. Thanks to all the growth-at-all-costs Internet giants, we’re all more alone than ever in and out of cyberspace. It’s too late to put all the evils and miseries of the world back into Pandora’s box, isn’t it? You premieres Sunday, September 9, 2018 on Lifetime.